The Wallbarz gymnastics set Transformer – the highlight in every child's room! Children have a natural urge to move. And that's good. Regular movement is important in many ways for children. It is important for the motion safety. It is important for the own independence. It is important for the spatial perception. Do you want to make sufficient space to move available for your children? No problem at all! Offering the gymnastics set Transformer, Wallbarz provides a great playing equipment for doing gymnastics for the indoor use - to do playfully several movements. 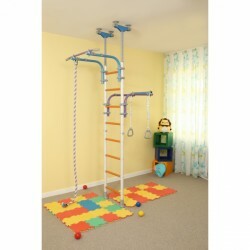 Wallbarz has been successful in developing a playing and climbing equipment, from which your children can benefit now. The innovative gymnastics set includes a rung ladder, a climbing rope, gymnastics rings, and an adjustable chin-up bar. For instance, different positions of the body and types of movement can be tested. Even the balance of the body can be tested in different positions and on different grounds. The Wallbarz gymnastics set Transformer – the name says it all. The gymnastics set Transformer can be transformed in many ways, because the chin-up bars can be individually adjusted and adapted to the height of your children. The assembly is quite easy. The Wallbarz Transformer can be easily clamped between the floor and the ceiling. The requird space is less than 0.5 square metres. In addition, the Wallbarz Transformer convinces by its stability and sturdiness. Offering a maximum user weight of 100 kg, several children have enough space to play. The Wallbarz gymnastics set fullfills all applicable safety standards and is suitable for children from the age of three. Super leuk ding! Er is al veel mee gespeeld het is ff wat bouwwerk maar dan heb je ook wat! Het is ff wat werk, maar dan heb je ook wat! Stevig zwaar spul, en ziet er vrolijk uit. Hij staat pas net maar ik denk dat ze hier veel plezier van gaan hebben!